Christmas is a time when loneliness can turn into a more sever mental health issue, when depression and anxiety can be at it’s highest for those suffering this mental health condition; and when suicidal thoughts can turn into terrible actions. One of the most important things for us all is to understand what help there is out there, be honest about our own mental health, and share our experiences with other sufferers; and most of all let them know they are not alone. While celebrities are opening up about their mental health issues in support of campaigns to change people’s perception of mental health illnesses, many see them as far removed from us ‘ordinary people’ and able to secure the resources required to help them deal with their mental health problems, that we are unable to find or even are aware of. In some ways, their examples can be even more isolating to those living alone or in families were there is a lack of understanding of depression, anxiety, schizophrenia, bi-polar and other mental health conditions. So, it is important we all understand that 1 in 4 ‘ordinary people’ will experience a mental health issue at some point in their lives. That it is certainly not a sign of weakness and not something to be ‘ashamed of’. Friends and family members can be a great source of support and help to come to terms with your mental health, recognise the causes, and then help you go through the process of recovery of your life and the management of a condition such as depression, anxiety, low self esteem and most importantly the removal of guilt that so many people with a mental health illness live with everyday. Nor should there be any shame in taking medication for your mind. After all, if you broke a leg, you wouldn't think twice about having it set in plaster to help it heal. 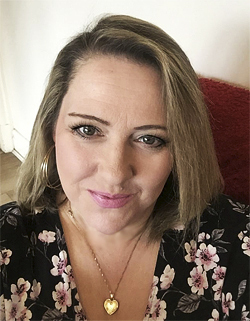 Below, an ‘ordinary person’, Tracey Walker, with honesty and candour; has opened up to her Face Book friends about her life’s traumas, including sexual abuse, and the subsequent damage to her mental health; in an attempt to help others who are suffering alone, without support and who may not even recognise that the way they feel can be addressed and alleviated once the causes are identified and appropriate help and support received. Abuse comes in many forms - mainly physical (the most spoken about) or mental. My life has covered both kinds, from sexual, physical and mental abuse. I've been blessed it never turned me to drugs or alcohol or behavioural issues. As humans we all cope with trauma in different ways. My way was to bury my trauma and problems and move on. At the time I never knew how unhealthy this could be. We can only hold pain and trauma for so long. Mine eventually came to light just before I hit my 50th birthday. How ironic I was embarking on a life finally for myself, since both of my amazing children were grown. However little did I know that finally no longer living in a state of fear would be the perfect time for my subconscious to let all my trauma be released. I never got the choice if I wanted it to or not ,suddenly I was crying daily for nothing, seeing demons everywhere and constant nightmares. Being a logical person. I first put this down to medication I was taking, so I discontinued the medication; still no improvement. Was I going crazy what the hell was happening to me, why couldn't I control my emotions? I have always been strong and could control what ever was thrown at me ... but this - how the hell can you control something you can't understand? O.K... maybe I was menopausal - so I began HRT - nothing, no improvement!!! I'd had therapy a few months before for anxiety attacks with Spinning World http://psspeople.com and was diagnosed with P.T.S.D. The therapist had referred me to R.A.S.A https://www.rasamerseyside.org - an awesome therapy and support for sexual abuse victims. It was so long ago I had forgotten about it, until the day I got the call they would start therapy with me. Little did I know this would unlock the door to all the anguish and pain I had suffered in my life - beginning from my sexual abuse I had suffered as a child from a close family friend. The death of my husband, who I never had the chance to mourn, the death of my Grandma, who I never got to say goodbye too, as I was trapped in Saudi, the death of my best friend who also had cancer, but left on holiday, as she didn’t want me to know she was dying and I never saw her again. Physical abuse from my brother in law, and mental abuse from my husband’s family on a daily basis. being stalked and people paid to spy and report back to my husband’s family. The attempt to take my children from me and steal my home, and the realisation that I may never see my friends and family and my country again. It didn't make sense - it was so long ago why on earth was it now affecting me?? The therapist explained I had spent so much time in flight/ fight mode living on adrenalin for so long. Now I was finally settled my body had to find away of coping with no longer feeding it adrenalin, which first turned it to anxiety, and then started bringing all the pain and trauma out. I had never felt so out of control with my feelings as I did at that time, I had spent years avoiding getting close to people keeping them at arm's length, but suddenly with this new-found emotion, I began to let people back in, I had so many good friends who helped me, they didn't shun me or hurt me they genuinely cared for me; I can never forget the help and the trust they made me feel once again in other people. I was no longer alone. It was O.K to share troubles, to open yourself up to love and affection. The timing couldn’t have been worse as I’d met a lovely man and now all this! I finally went to my doctor on the advice of my therapist. Upon assessment by the therapist it was found I was suffering from not only P.T.S.D but depression. What????? My doctor decided to trial me on Sertraline 50mg. I had always been against medication, preferring the natural route, but I couldn't carry on like this any more. I have been very blessed to have had no side effects, the dosage has been spot on and I am finally beginning to feel like a new woman. It's been enlightening to start understanding yourself as a person, we all go through our lives grumbling of things that truly are minimal in the grand scheme of things. Learning your strengths and how to combat your weaknesses, how to love yourself: the saying you must love yourself before anyone else loves you is true. We live with ourselves until we die, we should love ourselves, care for ourselves and spoil ourselves. We are the most important person in the world and we should 'Never ' forget that. The most powerful and meaningful words I have taken to heart are the words “I AM” because you are anything you want to be, only you have the power! "British women returning from the middle east are aprticularly badly served, and in need of specific support and mental health services. Currently, there is no therapy here so women such as myself have had to come back to no support. Religion isn't a factor. We are british but we go thru the same thing as refugees cos we were away so long - but the refugee agencies wont see us - and the western standard therapy doesnt understand us so we are in no mans land. I want to change that."